Victor Osimhen, top scorer at the 2015 Under-17 World Cup, has said he is not rushing to decide his club future. He currently plays for Ultimate Strikers in Lagos and has spent time at German club Wolfsburg and is also set to visit English side Arsenal. 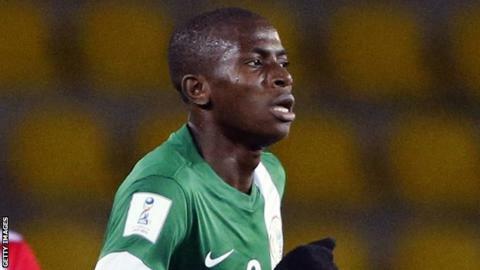 Osimhen, who turns 17 on 29 December, scored 10 goals to help Nigeria win a record fifth under-17 title in October. "The trip to Wolfsburg was interesting and I'll be visiting Arsenal too, but I am not in a rush," he told BBC Sport. Why does Victor Osimhen have to wait? Football sides are not allowed to sign any foreign players under the age of 18 unless both team and player are from an EU country (or are less than 100km apart across an international border) or the player's parents move to that country for non-football reasons. "I know I cannot sign a contract with any club right now but the trip to Germany and hopefully to England gives me a great opportunity to see things clearly. "It is important not to get carried away and luckily I have my family and managers to guide me through every step when the time comes." Under current Fifa regulations, Osimhen is not able to sign for a European club until his 18th birthday. However, Burkina Faso's Bertrand Traore played in pre-season friendlies for Chelsea before he turned 18 and then signed for the English side as soon as he was able to. Osimhen's 10 goals in Chile at the Under-17 World Cup eclipsed the previous best of nine set by Ivorian Souleymane Coulibaly in 2011 and Florent Sinama Pongolle of France in 2001. The gangly striker, who idolises former Ivory Coast and Chelsea forward Didier Drogba, said: "The first step is very important because it will define my career and progress in the game. "It's easy to hear different views from people about what they think is good for my career and I really appreciate that. "But I still have time decide and I want to make the right choice that will create the paths to fulfil my potential and achieve bigger things in the future." Osimhen was also part of the Nigeria side that won the Under-23 Africa Cup of Nations in Senegal in November, which also saw them qualify for the Rio Olympics next year. He has been nominated for the 2015 Confederation of African Football Youth Player of the Year award. Fellow Nigerian Kelechi Nwakali, who was named MVP at the U17 World Cup, Samuel Diarra (Mali U17), Adama Traore (Mali U20) and Yaw Yeboah (Ghana U20) are also up for the award.